1743, Bavaria. A French army is trying to seize an important passage leading to Vienna. It is in a small valley, where lies the village of Talheruntersdorf. 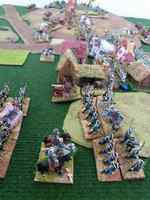 Greg and I had yesterday a large battle with our French and Austrian armies. I had to improvise on the spot with the table setup as well as with the orders of battle. 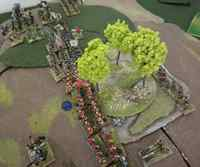 We took 9 brigades each (a huge battle ), placing alternately one brigade on the table and letting at least three brigades to enter on our table side, whenever we felt it was the time. The picture shows the starting situation. We would take points if we control Talheruntersdorf village, the most of the gentle hill (right) or the most of the crest of the steep hill to the left. The wooded and green area is bad going, no artillery allowed and infantry and cavalry marches half move. The taking of the steep hill would be easier for Greg, as he had a great number of Grenz troops and Hussars. I had fewer hussars and only one light troop, the Chasseurs de Fischer. Either you give Greg to command DBM Ugaritic chariots or HoW Hungarian, he likes to form his troops in a continuous linear cordon. One and a half brigade of Grenzers on his right to contest the steep hill, covered by a dragoon brigade, line infantry brigades, his grenadier brigade destined to attack the village and a cavalry brigade with a biiig regiment of elite Kurassiere, the punch of his army. But a greater punch was this threefold: He plays Austrian, has many more guns and he's Greg! 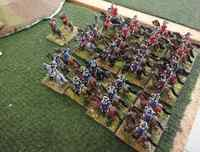 French Dragoons and Chevaulegers face the fearsome elite Austrian cuirassiers! Apart from the dragoons, the other regiments are inferior. In the middle of the Austrian line, two brigades advance towards Talheruntersdorf. The French decide to throw in the game La Maison du Roi. Bring a 1 and stay at the edge of the table. The battle in and around Talheruntersdorf is starting. The "German" brigade cover the right flank of the village, but receive canister fire from massed Austrian artillery. The Chevaulegers attack the Austrian cuirassiers but, inferior as they are, they lose heavily. The "German" brigade covering the right flank of the village lose one battalion after another from (impeccable dicewise) canister fire. La Maison du Roi bring another 1 and cannot chase the terrible Austrian cuirassiers who, killed a small Chevauleger regiment but got three hits. They change into line formation on the time that the Austrian guns turn their attention on them. Starts the battle on the steep hill! The Irish brigade reinforced by an elite Swiss regiment have the task to throw the Grenzers out of the woods. On their extreme left the French have thrown in a fresh dragoon brigade of three inferior regiments. This pic is taken from the Austrian point of view.